In medium bowl, beat milk and pudding mix 2 minutes with electric mixer at medium speed or 2 to 3 minutes with wire whisk until well blended. Stir in lemon peel. Refrigerate. Heat oven to 450°F. Remove pie crust from pouch. Using rolling pin, roll crust to 15-inch diameter. With lightly floured 3-inch round cutter, cut 16 rounds from crust; discard scraps. Fit rounds into 16 (2 3/4-inch) ungreased muffin cups, pressing in gently. Generously prick crusts with fork. Bake 5 to 7 minutes or until very light golden brown. Remove from pan; cool completely. 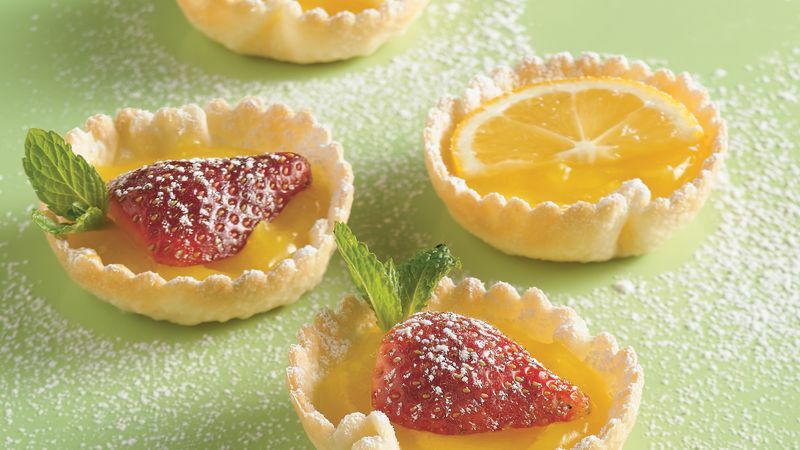 Spoon lemon filling into tart shells. Garnish with sliced fruit and mint leaves. If desired, sprinkle with powdered sugar. Turn these into banana cream tarts by using banana instant pudding and pie filling mix and sliced bananas. Bake and freeze the crusts up to 3 months ahead.